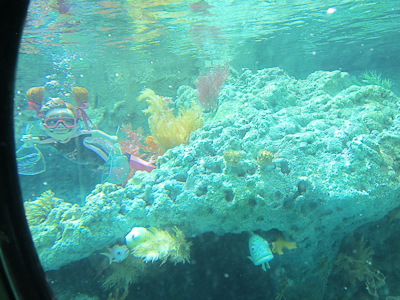 In 1959, Disneyland launched its E-ticket attraction, Submarine Voyage. In the lagoon in Tomorrowland near the Matterhorn, which you can’t miss because it’s a big bunch of water, submarines traveled under the polar ice cap and saw, among other things, fish and mermaids. I remember this being a particularly cool ride. However, it closed in 1998. And then we waited. And waited. And waited. And waited. 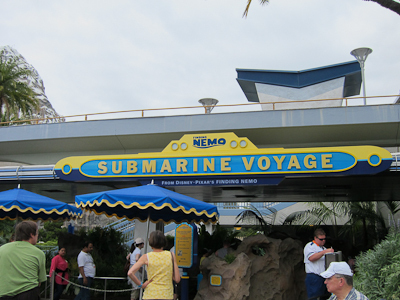 And after what seemed like forever but was really nine years, Disneyland opened the Finding Nemo Submarine Voyage in 2007! 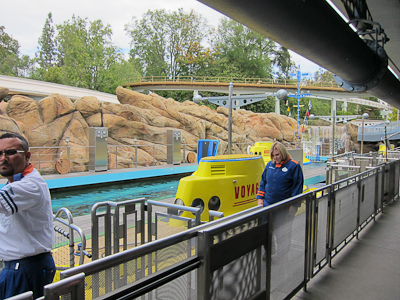 I remember when Nemo first opened (which isn’t much of a feat since it was 5 years ago) and line was loooooooong. It stretched back to Small World and back. Now if you’ve been to Disneyland, you can appreciate how long that is. But if you haven’t–it’s long. The Nemo queue is a bit uninspiring. Toward the end it’s just switchbacks, but it’s covered! Your submarine is a cheerful yellow with blue accents. The sub is already at water level, so you cross a removable bridge and climb down one of two sets of spiral stairs to get inside. I’m always kind of paranoid that I’m going to take a nose dive down those stairs. However, so is everyone else, so we all step carefully and hold onto the rails like our lives, or at least our legs, depend on it. Ingrid’s sunglasses on her head are really trippy here–it looks like she’s looking up at me when in fact she’s trying not to trip and kill herself. Inside the sub is a tight squeeze. 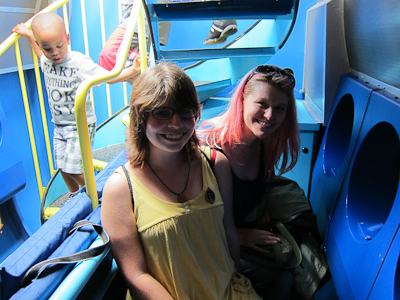 Two rows of seats line either side of the sub, and each seat flips up, so you walk to the end, flip your seat down, and smile for the camera. You do have to get cozy with your neighbor. 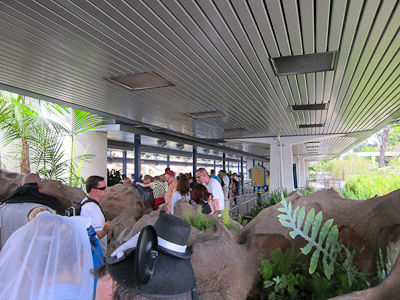 In true Disney efficiency, each sub entrance feeds directly into its own row. Oh, maybe I should take this opportunity to point out that the submarine is not idea for people who cannot make it down the stairs or are claustrophobic (or both). Fortunately, you can wait in the regular queue and when you reach the front, tell the cast member you’d like the “alternate experience,” which is a room with a video presentation. All the fun of the submarine without being in the submarine! 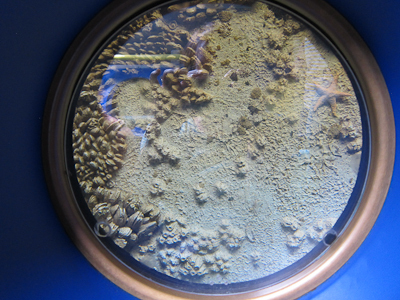 Anyway, directly in front of you is your very own porthole. The porthole gives the effect of making you think you’re like 3 inches away from the wall and could go screeching across it Titanic-style any second now. However, this is just an illusion. In fact, you are 5 inches away from the wall and probably are not going to scrape it. After your sub is fully loaded, your narrator comes on and informs you that through the power of Disney magic, you are in Australia. Cool! 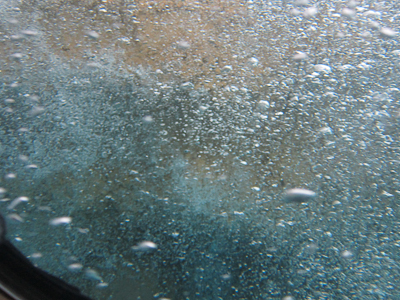 You avoid scraping the wall and enter the lagoon, soon doing your first of two dives. 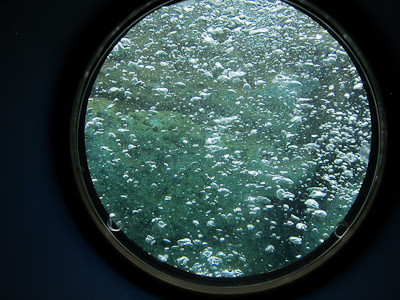 You know you’re diving because you can see it out of your porthole. You don’t dive very far though. You can still see the surface, and some coral and other things you find under water, and the girl from the movie with the unfortunate orthodontistry. But then you dive a little deeper and that’s where the Nemo action happens! 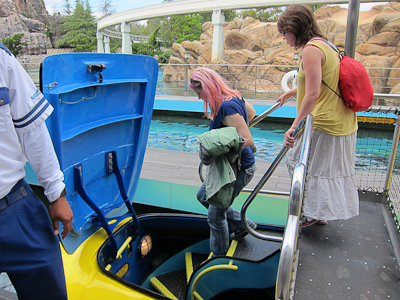 In reality, you go under a waterfall so guests outside see the submarine disappear, and the sub continues on its journey. But when I was little, I really did think you dove way, way down. Anyway, soon our Nemo friends start showing up. And this is where it gets really hard to photograph. It’s Dory! And an in-motion Marlin! The fish effects are really neat. 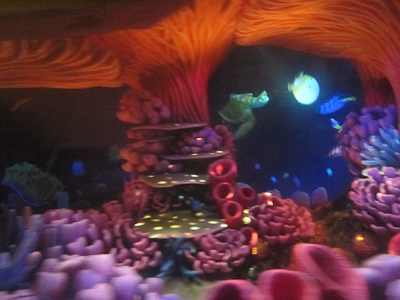 It’s a projection, so the fish actually swim around in front of you just like the movie. They’re not objects on posts or dangling on strings like the original Submarine Voyage (which was cool in its time, but technology marches on). Also, each submarine is equipped with its own “sonar hydrophone” that allows you to eavesdrop on what the sea life are saying. Even Dory speaking whale! 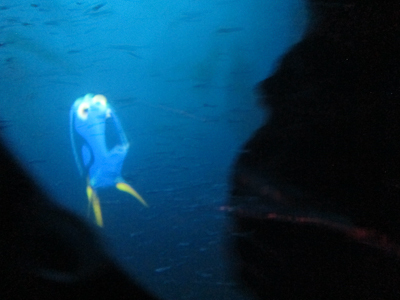 One thing I should mention–parts of Nemo Submarine Voyage are kind of scary. Toward the beginning, electric eels jump out of holes, for example, and the lights are dimmed inside of the sub. And then if you’ve seen the movie, you probably remember the fish with the lightbulb over its head and then the whole thing lights up and it’s got these huge teeth and everything–that’s there too. As well as Bruce the shark with sharp teeth. 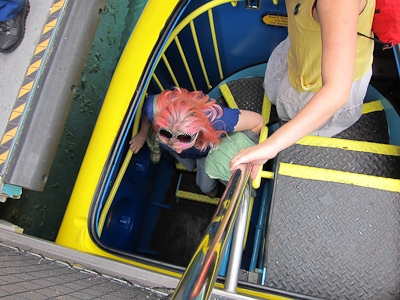 I’m saying this because we took my BFF on this ride and I’m pretty sure her daughter, who was I think 4 at the time, is still severely traumatized. I felt so bad! You so totally rock! Duuuuuuuude. 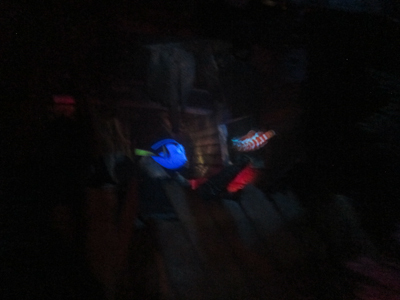 But there’s good news–Marlin and Dory find Nemo! Hooray! And pull into the loading dock, having completed your voyage. I really like Nemo. I don’t think I’d wait a very long time for it, but it’s a fun ride and if you’re okay with being a bit squished and the scary parts don’t bother you or any member of your party, it’s a nice, air-conditioned way to spend a few minutes.